According to the PMBOK definition “A project is a temporary endeavor undertaken to accomplish a unique product or service with a defined start and end point and specific objectives that, when attained, signify completion”. By the year 1990 onwards almost every industry started the practice of project management to overcome the hurdles of managing – Budget, Tasks, Time, and Resources. Now the question is – What do we mean by Project Management? According to the PMBOK definition “Project management is the application of knowledge, skills, tools, and techniques applied to project activities in order to meet or exceed stakeholder needs and expectations from a project.” In general, it is the lack of efficient methodology or standard that is responsible for failure of a Project, and that is why various methodologies or approaches get evolved starting from traditional approach of Project Management to other disciplines like – Critical Chain Project Management, Extreme Project Management, Event Chain Methodology, PRINCE2, Process-based Management with different approaches. Kovair Software Inc. comes with a web-based Project Management Solution to meet enterprise goals with wide array of in-built features like – cost estimation, automated process aligned to the business, managing resources, allocation of tasks to resources, timesheet to capture time details of task execution, reporting, and management visibility through Dashboard. Kovair Project Management also provides the facility to integrate the solution with third-party or vendor neutral solutions via its in-built Omnibus (Integration Bus for ITTM). Today, there are several Project Management tools available in the market claiming them as the best software to meet the demands of Project Managers or Business Heads. Apart from managing Tasks, Time and Resources effectively, Kovair also manages various phases that a Project comprises of – Requirements, Change, Test, Defect, Release, and others, and thus becomes a complete suite for the management of development projects. The objective of this paper is to explain each feature of Kovair Project Management Solution. Challenge for the management is to define a Project, plan it accordingly to achieve the goal, follow-up the plan and deliver the job/service as per the agreements. The success of a Project mainly depends upon its planning – how best you can estimate and how efficiently you can follow the plan. When we talk about plan, the first thing that comes to mind is the "Date and Time" to start the Project and to complete it. The second important thing is a set of "Activities" or "Tasks" carried out by resources to attain all the granular level objectives that sum up to a Project. Finally, it is – "Resources" (mainly – human, capital, infrastructure) the tangible medium that directly participate in the lifecycle of a Project either by accomplishing certain activities or providing support to accomplish the activities by others. Task Management broadly speaks about allocation of right Task to right resource at the right time. It is quite easy to manage Tasks and their follow-ups when you are working with limited resources, but as the organization grows with increase in the number of resources, it becomes necessary to go for a tool for managing the Tasks. Task Management is a component of Kovair application that you can have with all available solutions – Requirements Management, Test Management, Issue Management, Defect and Risk Management and Project Management. Kovair allows manual and automated Task allocation for different stakeholders. Manual Tasks can be created by the Managers for their groups to work on them, and record the Time invested. On the other hand, automated Tasks are generated to the resources through Kovair’s in-built process engine. 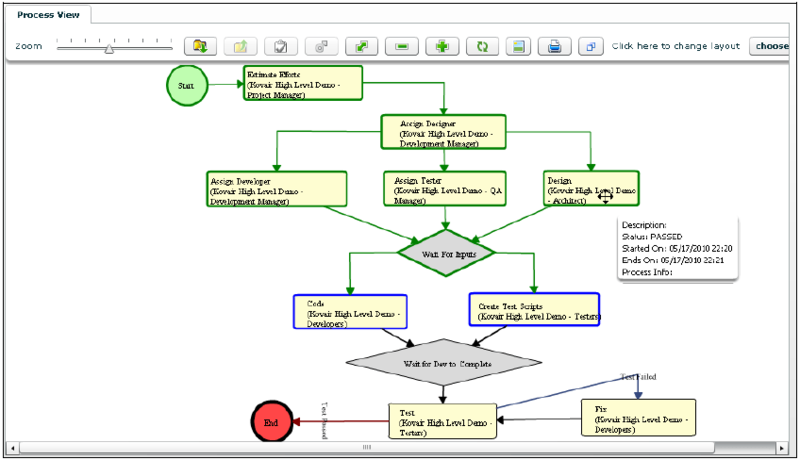 Administrators can configure different workflows/business processes through Kovair’s visual drag-drop designer. Process, in Kovair, is a series of automated activities that facilitates systematic and organized workflow management in a distributed environment. A "Workspace" level process is a broad process involving several processes running simultaneously at the entity level. You can design "Linear Process" or "Sophisticated Process" as per your need. A "Linear Process" contains series of operational steps and activities. A "Sophisticated Process", on the other hand, includes "Conditions", "Loops" and "Paths". The execution of a sophisticated process depends on the satisfaction of the "conditions", and the direction of the "Path" (Probable/ Else), as defined in the process. Which Tasks will be allocated to whom, and when – are defined only once when designing a Process. On activation, Tasks are automatically generated to the respective owners as per the progression of workflow, and thereby reduces the risk of manual intervention in Task Management. Automated and Customized Task-based Process along with the provision to create Tasks manually. Generate multiple Tasks for different resources and/or roles for a particular item of a Project. Project item can be anything like – Requirement, Test Case, Issue, Defect, Service Request, Incident, Problem, Change, and so on. Kovair also allows you to define parallel Tasks for same or different sets of resources. This is considered as a unique feature of Kovair Project Management solution. So you are free to implement and manage multiple Tasks independently and dependently. Design custom Task Forms with artifacts that you want to expose to resources who will accomplish the Task. Granular level securities can be imposed in the Task Form by restricting users to view or edit sensitive information that are exposed in the Task. One-click navigation to the record (Requirement, Test Case, Issue, and others) directly from within the Task Form. Kovair provides the facility to expose the item (for which you are generating Task) as a link on the Task Form. Often resources need further information on the record for which he/she is supposed to accomplish a Task. Such one-click access of record from the Task helps the resource to work independently and reduces spare dialogues among the workgroups. Impose assignment policies on the resources to accomplish the Task. The policies can be either one of three types – Queued Task, Individual Task, and One Task for All. Queued Tasks assign a Task for multiple resources at a time. The resource who first picks up the Task becomes it owners and responsible to accomplish it. Other resources who had been assigned that Task get relieved from doing the job. Individual Task assigns a Task to a set of resources with a policy that determines when the Task will be granted as "complete" considering the number of resources (in terms of count/percentage/condition) participated in accomplishing the Task. Finally, the last Task assignment policy – One Task for All assigns a Task to a set of resources, and all resources are equally responsible to accomplish the Task separately by their own. Under the integrated setup of Kovair application with other third party tools, you can synchronize the processes to workgroups working on different tool environments. So, keeping that in mind, Kovair provides the facility to expose cross-tool Tasks via Omnibus ESB with Kovair "plug-in" or adapter for the tool. Close association of Task with Timesheet – another component of Kovair application. It allows the resources to record Time against each Task. Download eCopy and read full document.